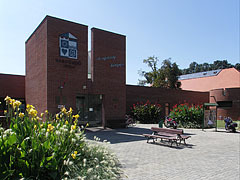 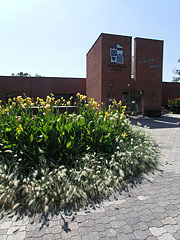 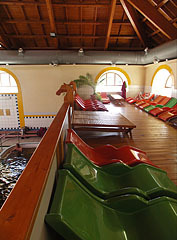 Originally the building was really functioned as a riding hall. 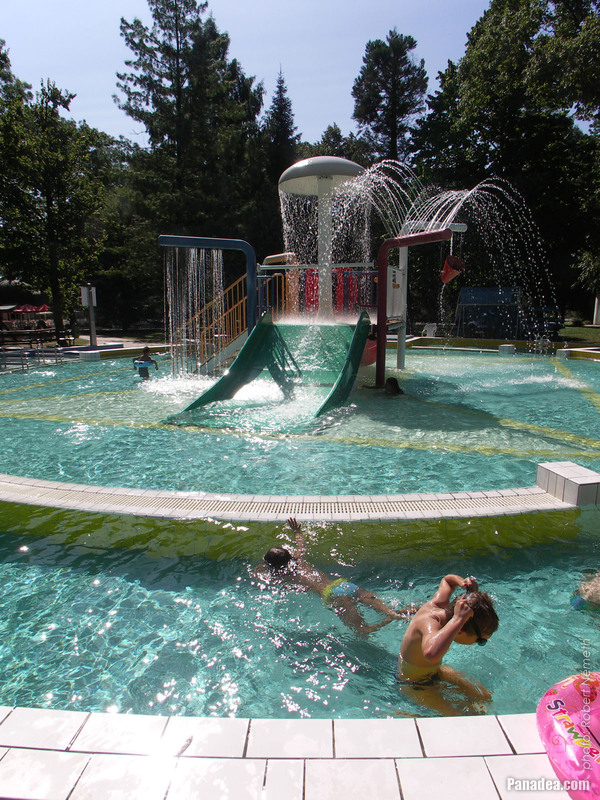 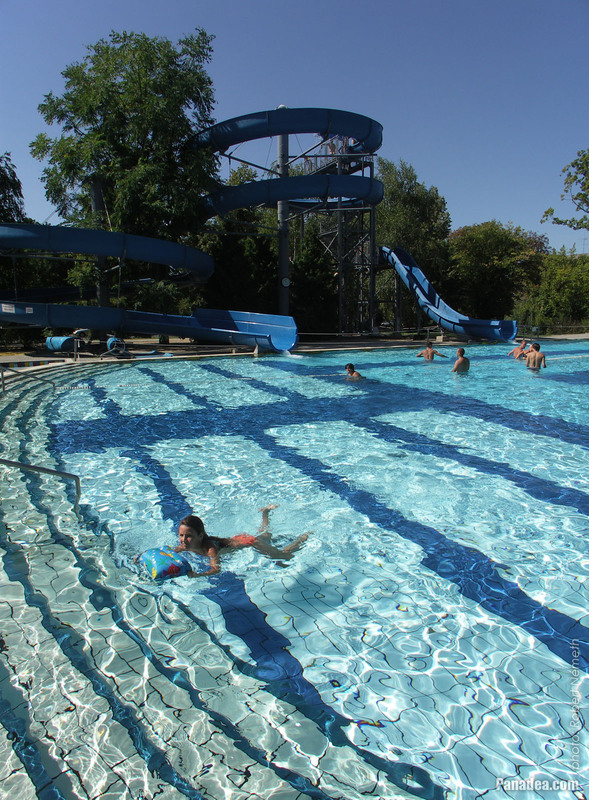 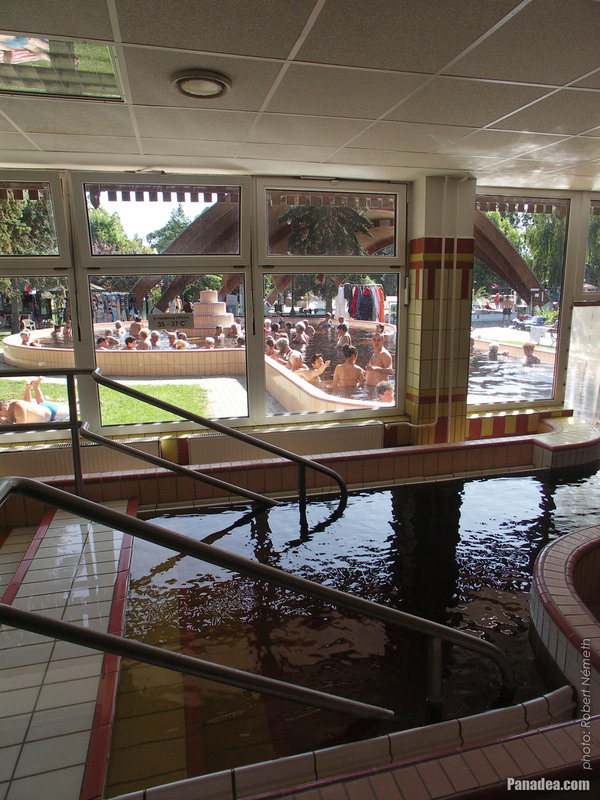 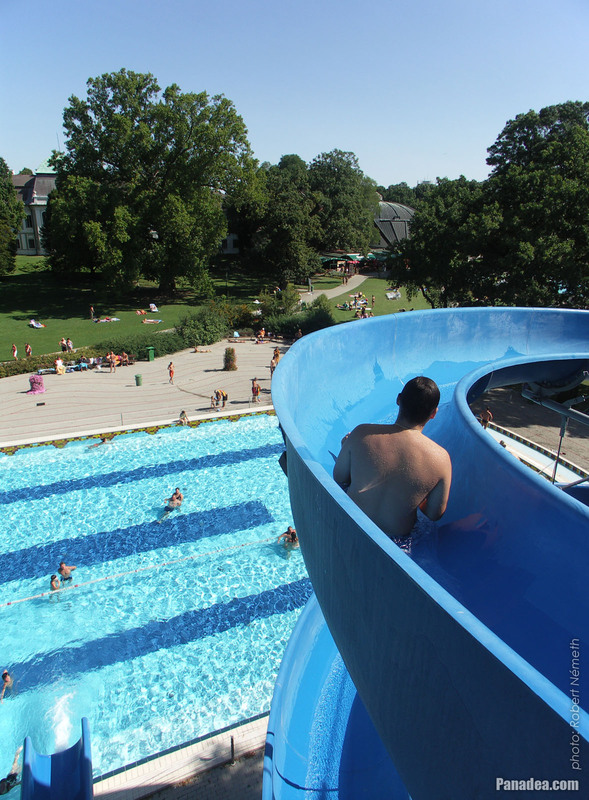 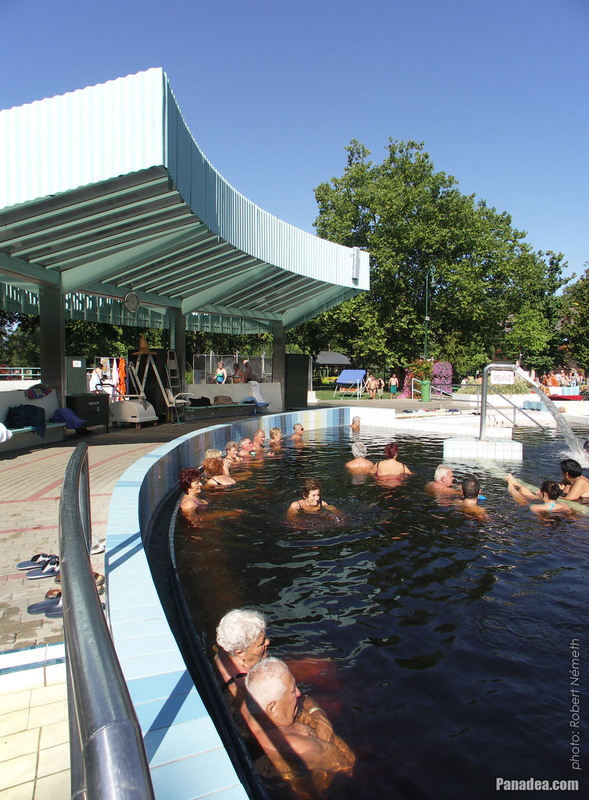 Since 2013 an indoor amusement bath complex, the AquaPalota can be found on its site. 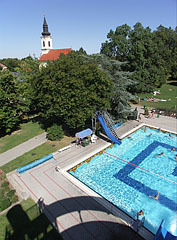 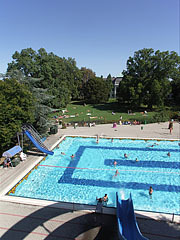 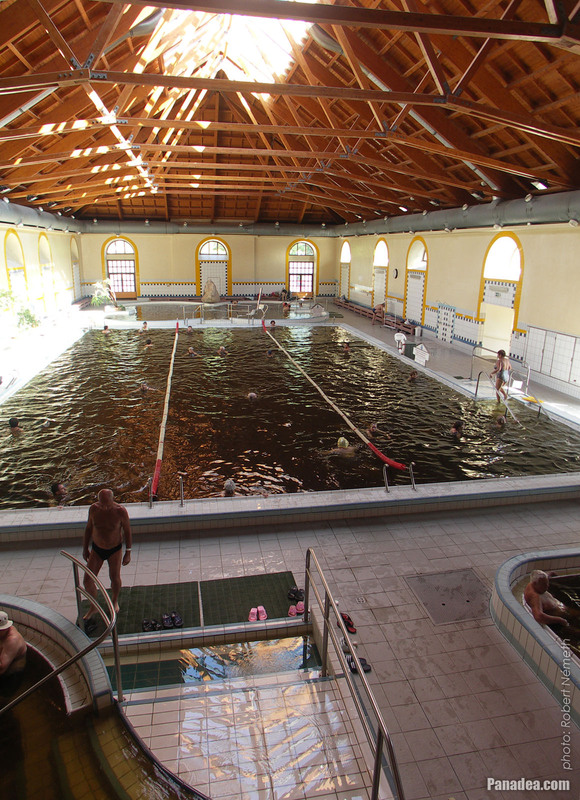 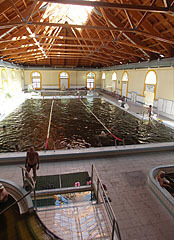 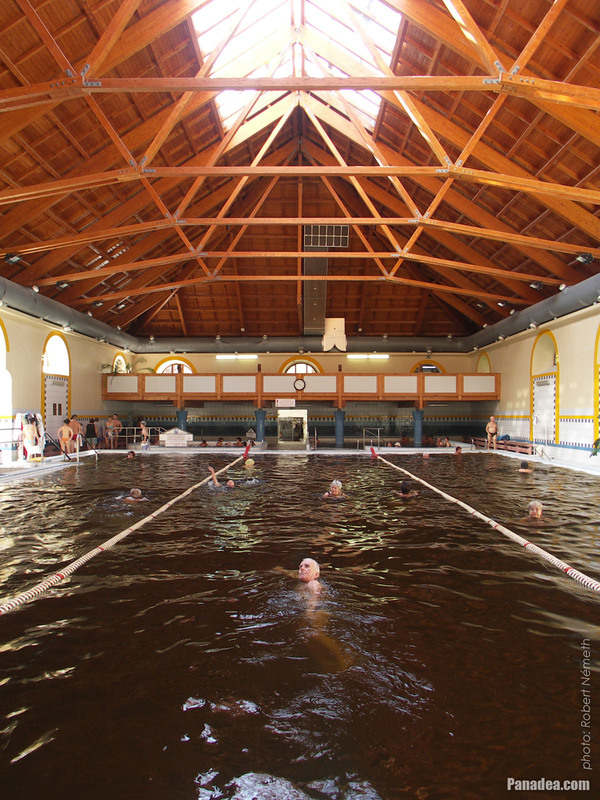 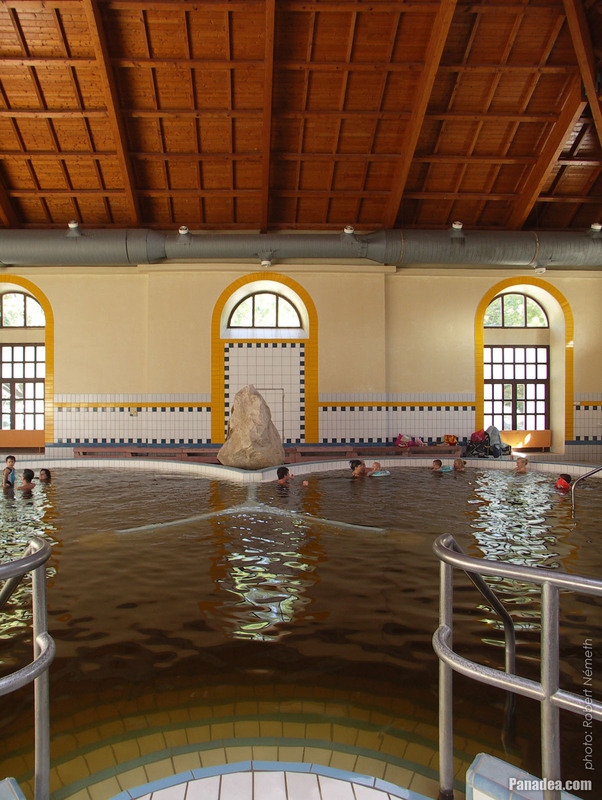 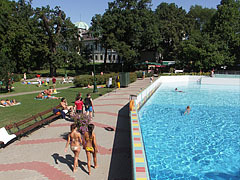 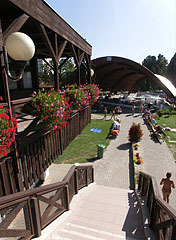 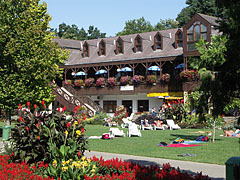 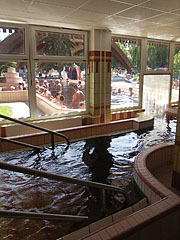 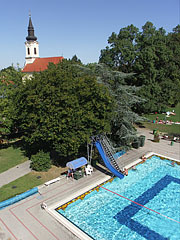 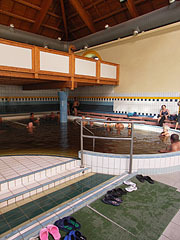 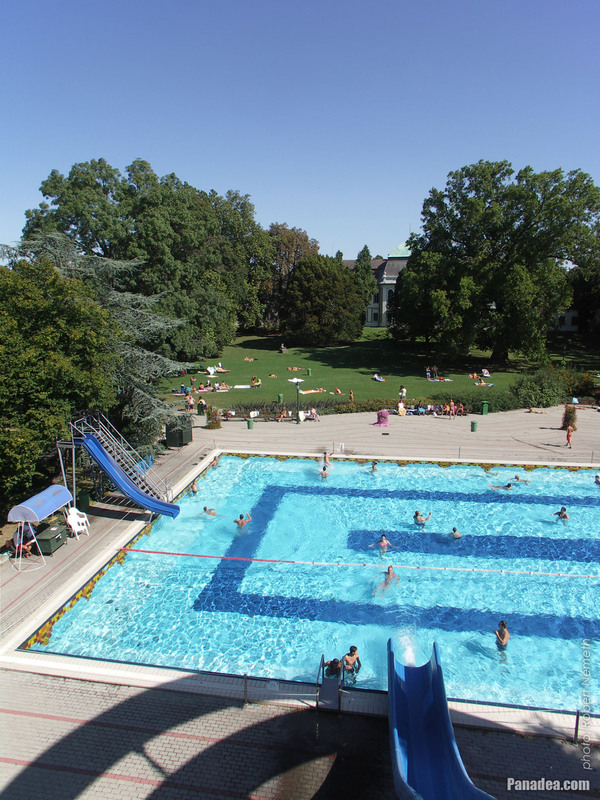 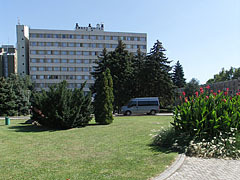 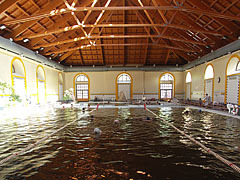 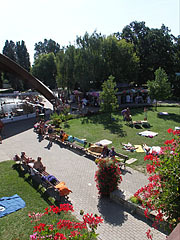 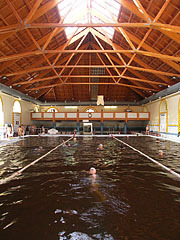 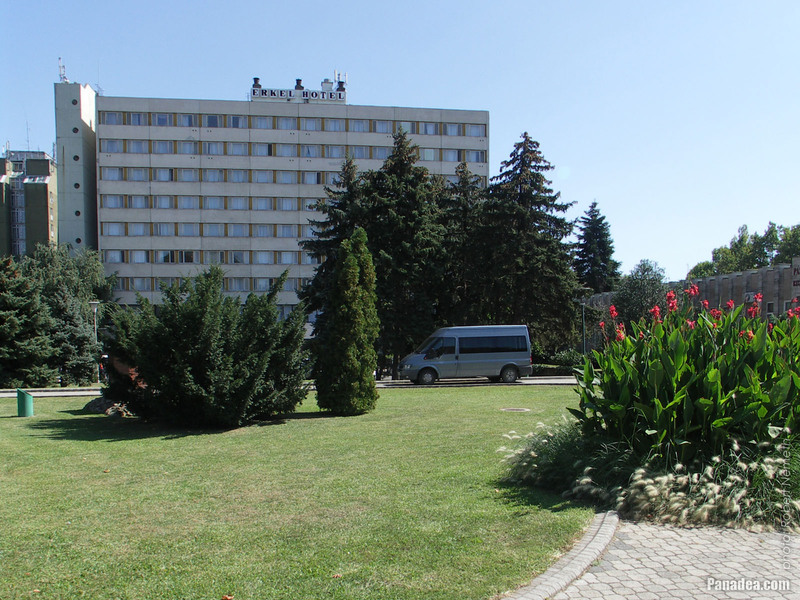 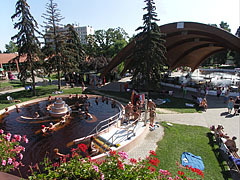 This pool was filled with 35-37°C mineral thermal water. 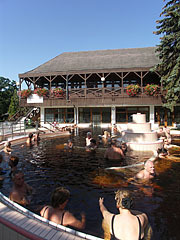 Bathing here was especially a great experience in winter when the snow was falling and the thermal water was covered with a vapor cloud. 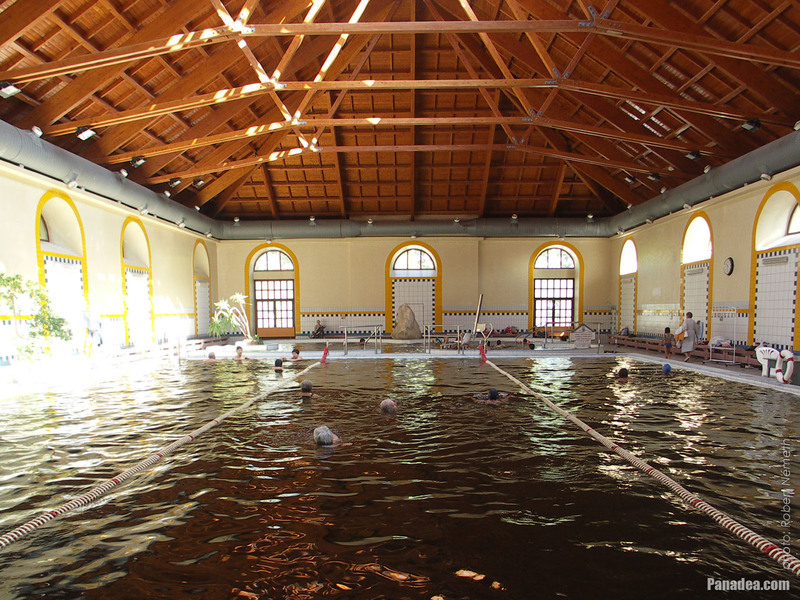 This pool and the characteristic arched wooden sunshade are unfortunately no longer exists. 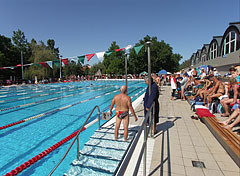 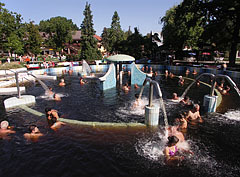 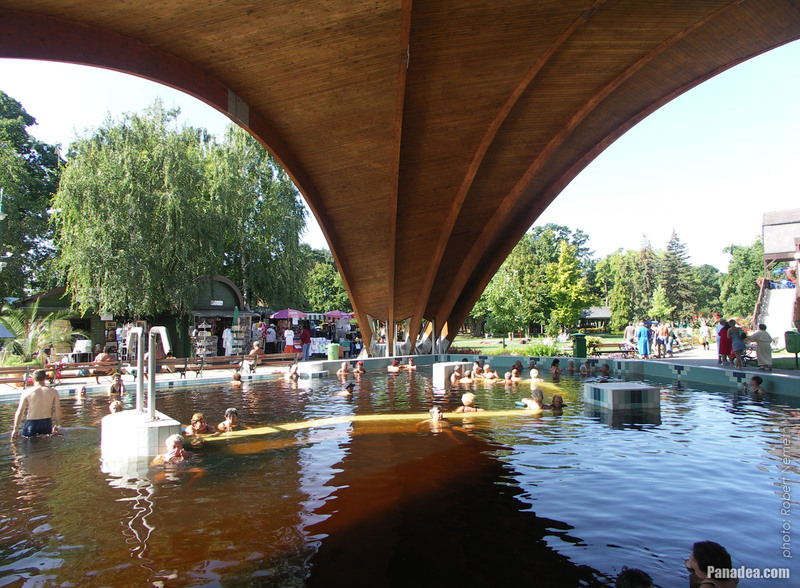 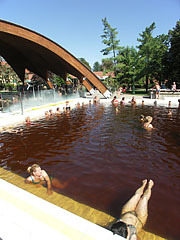 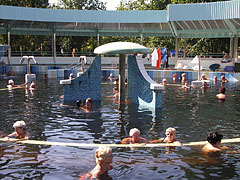 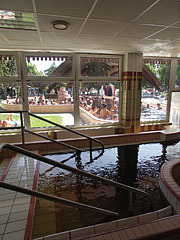 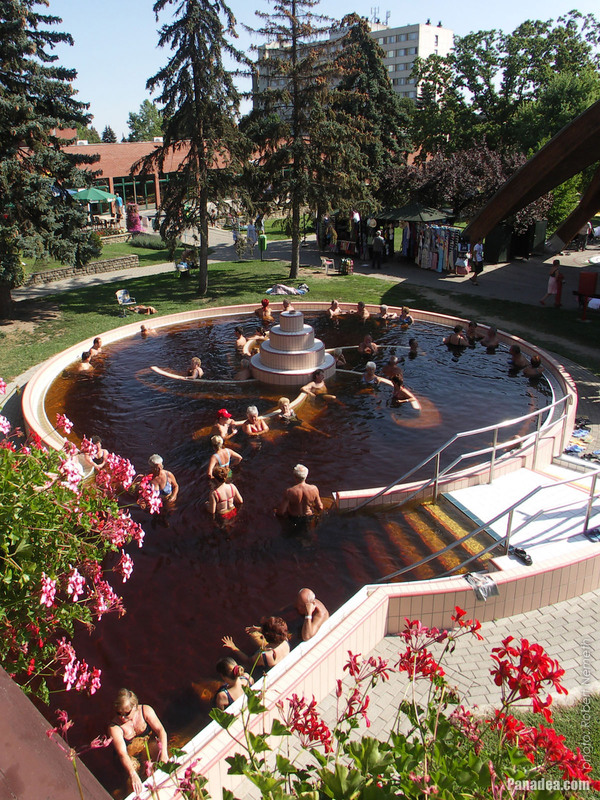 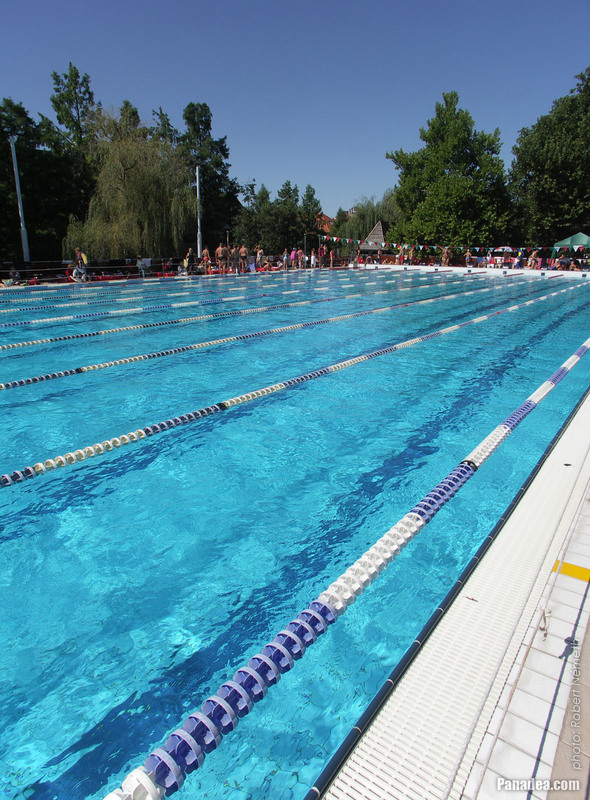 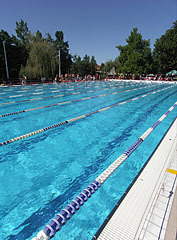 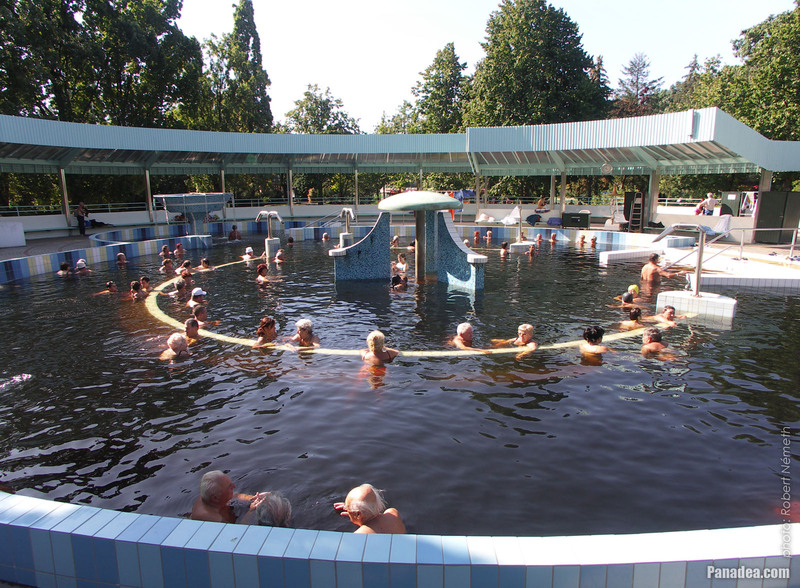 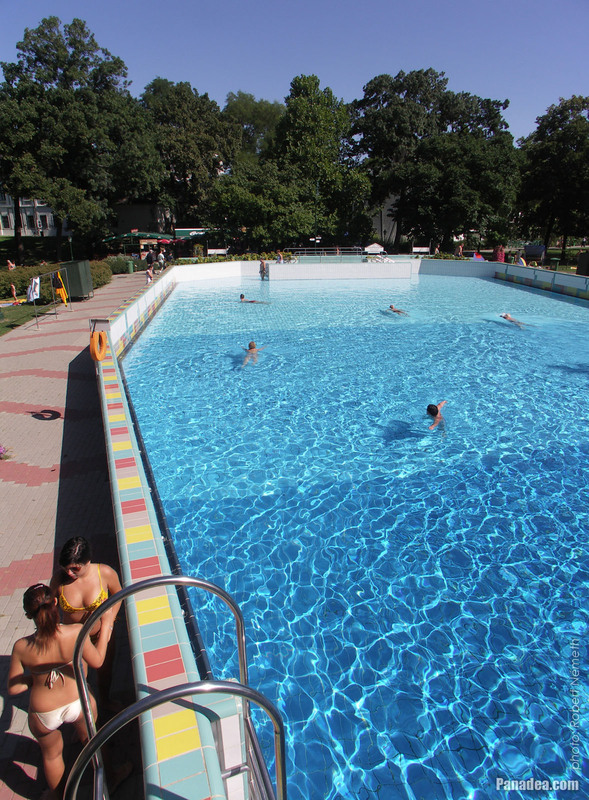 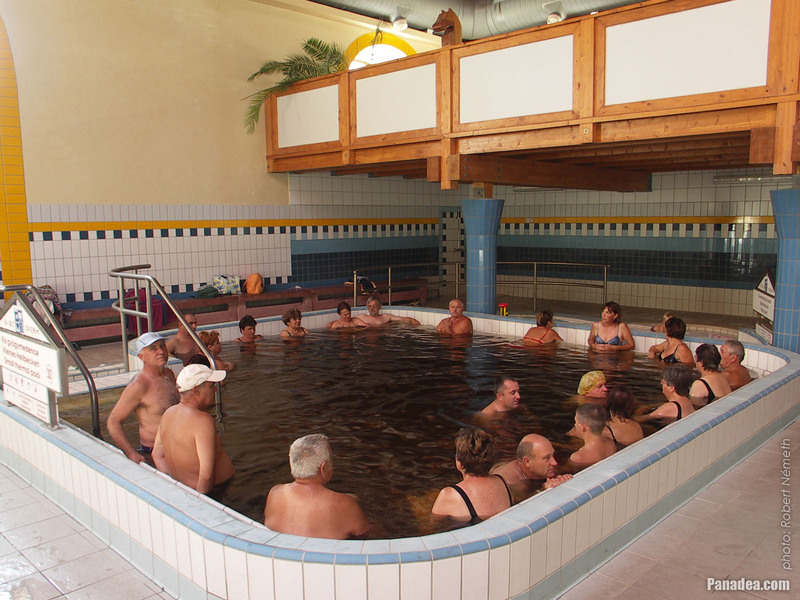 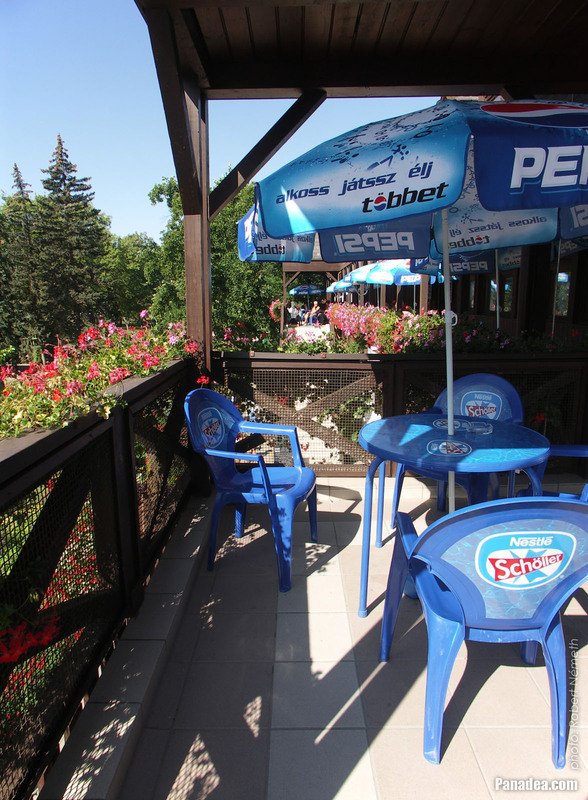 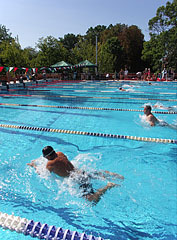 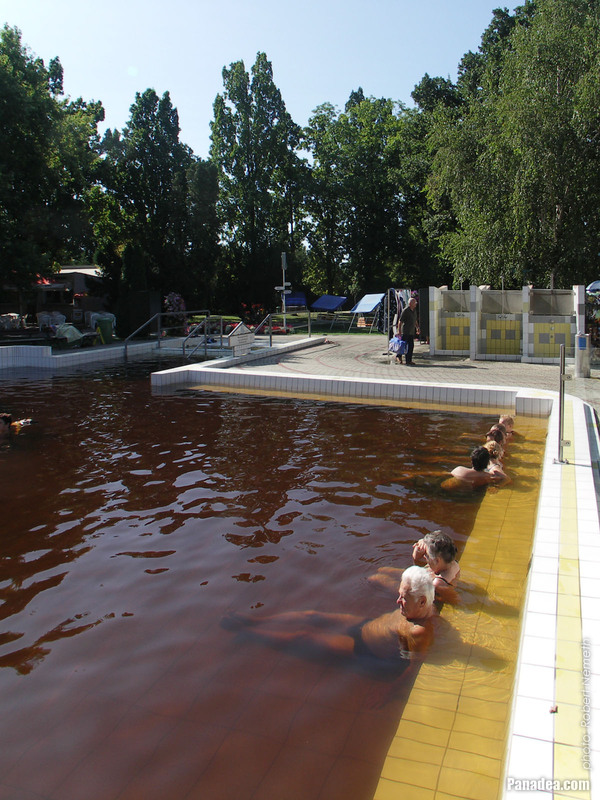 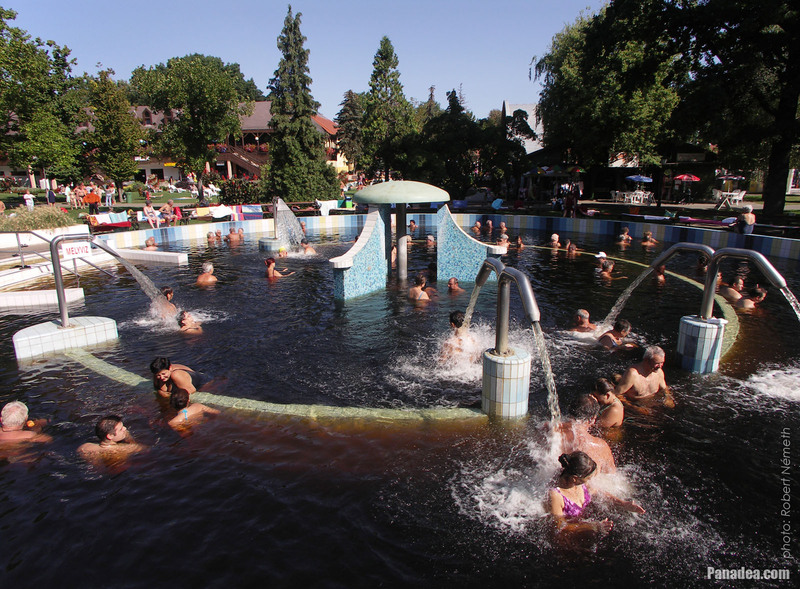 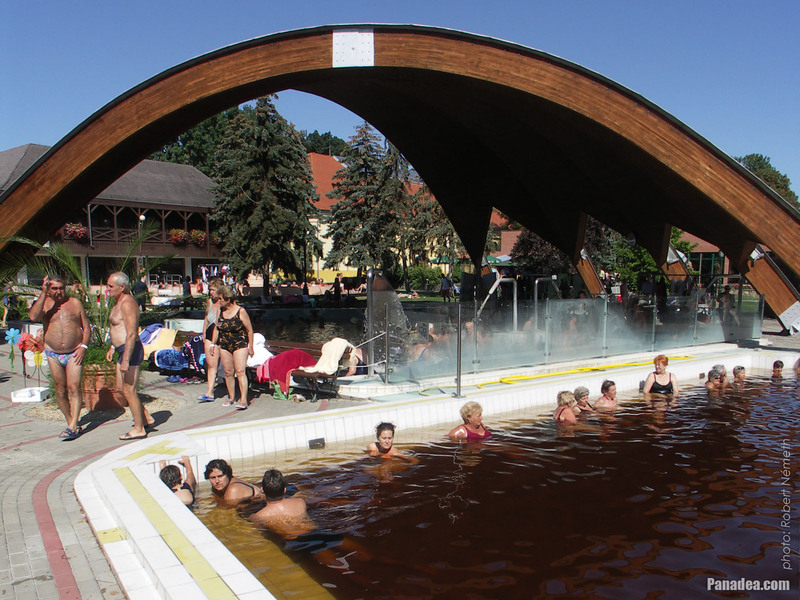 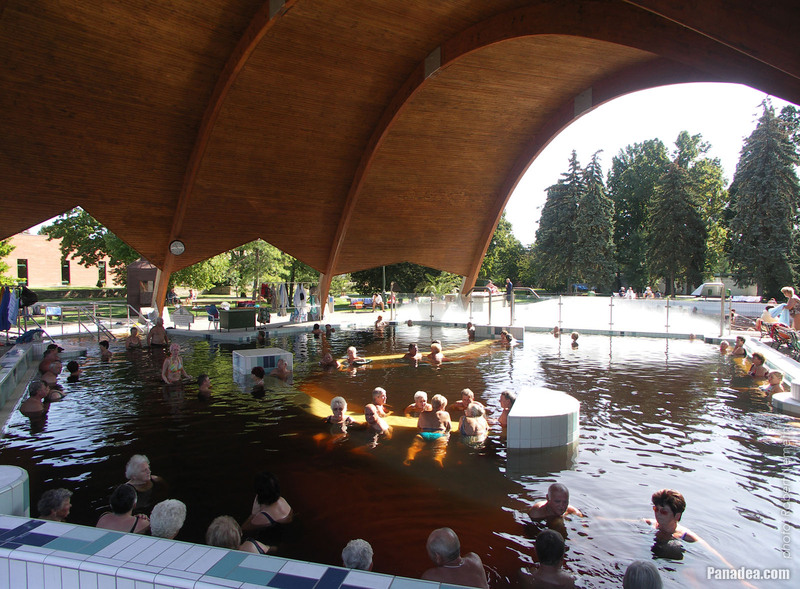 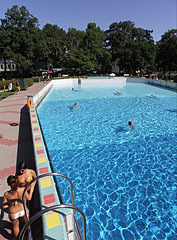 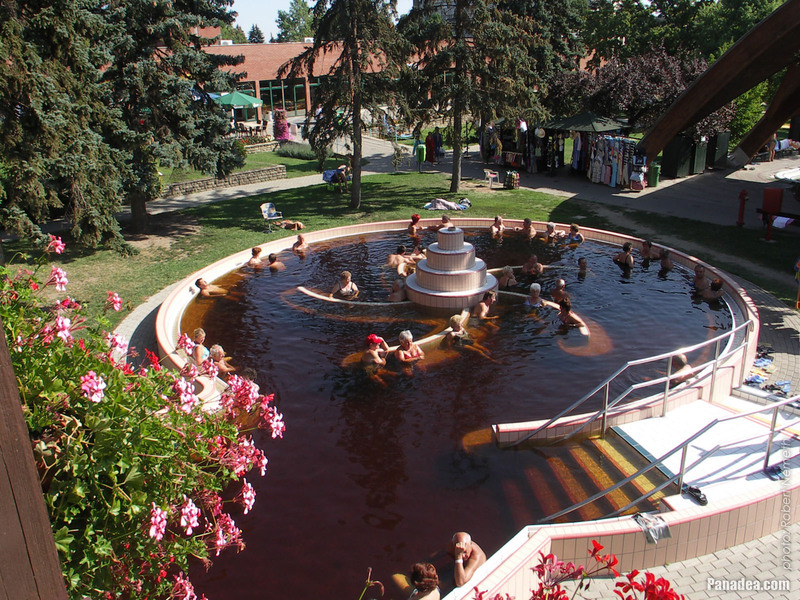 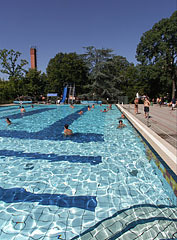 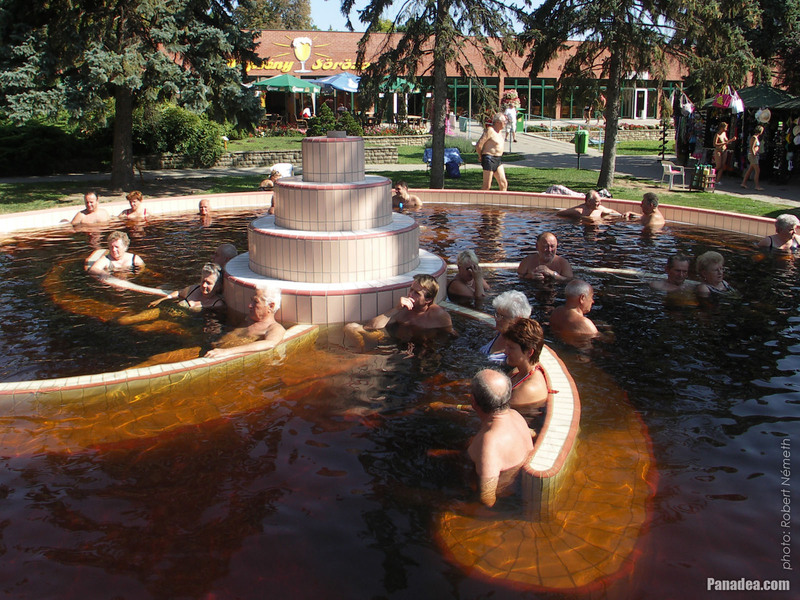 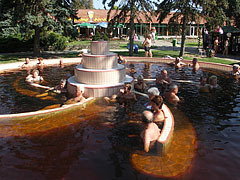 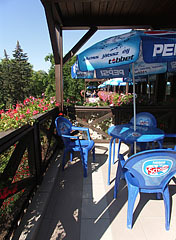 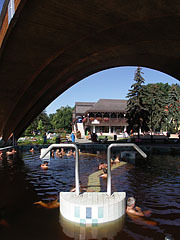 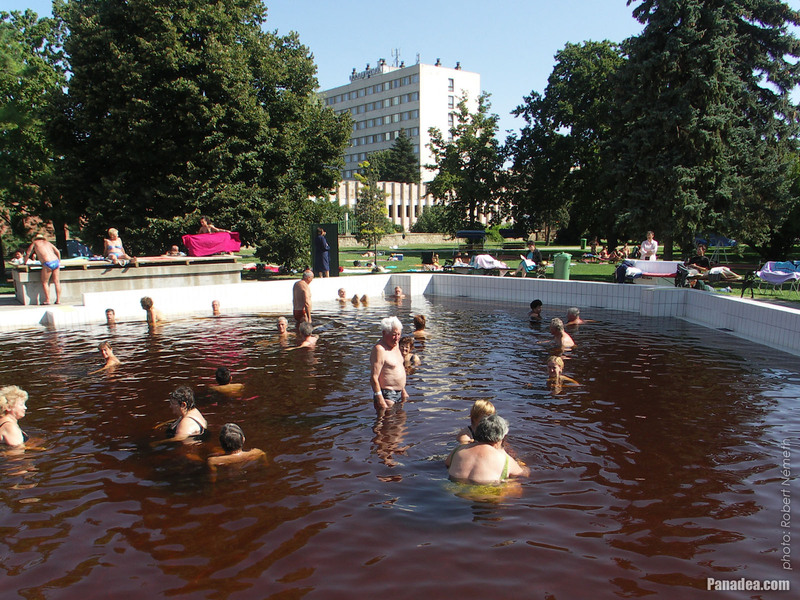 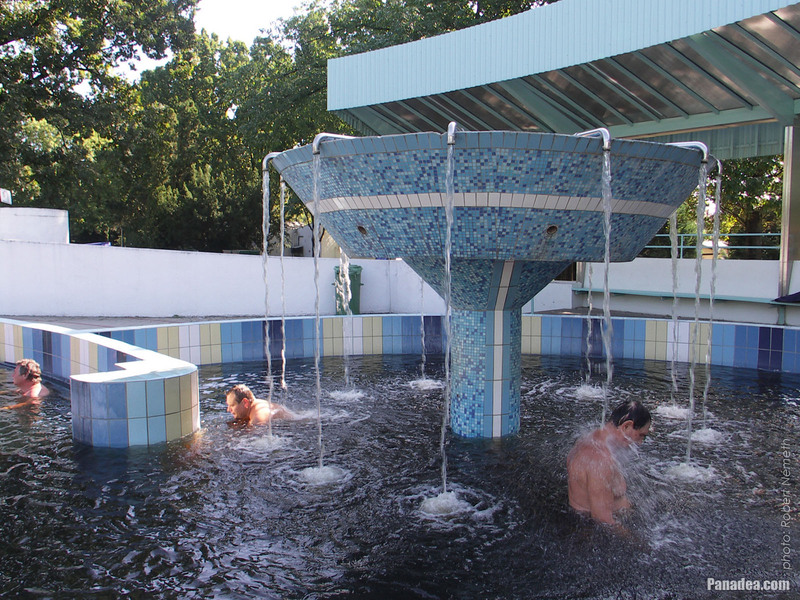 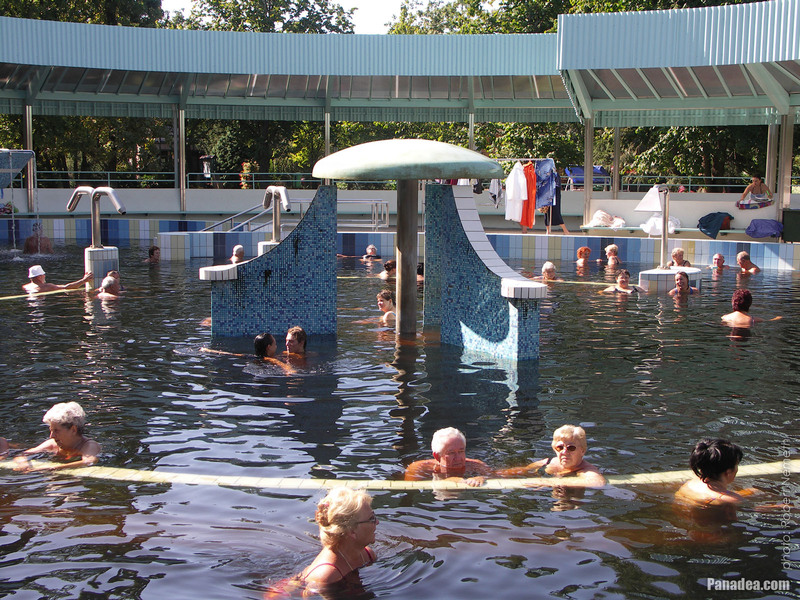 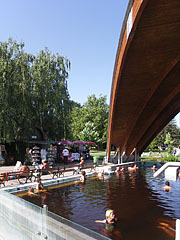 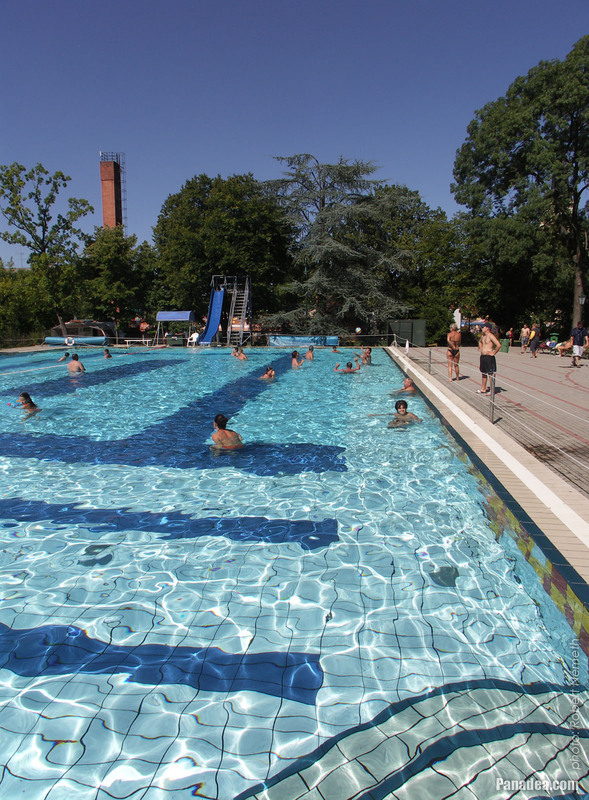 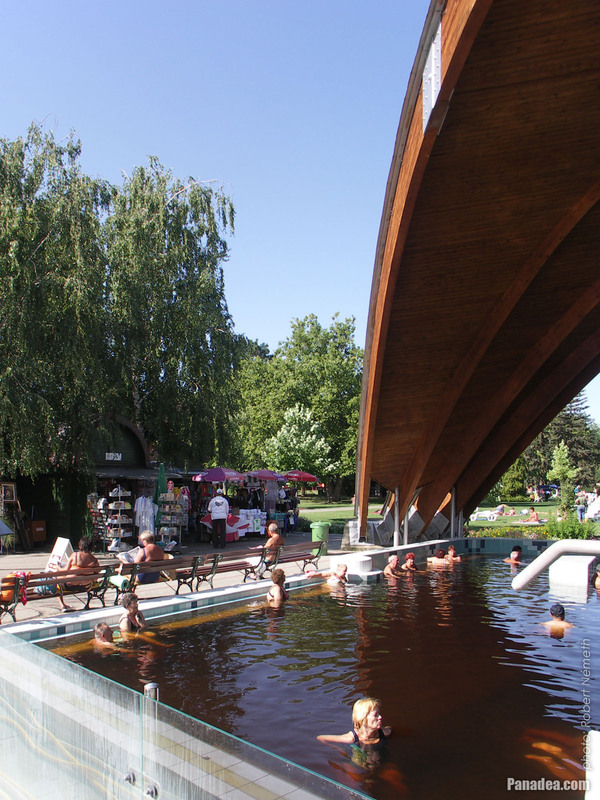 The temperature of the curative mineral water in this pool is 31-34°C. 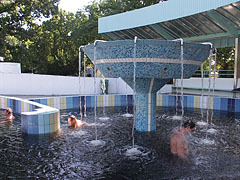 Water jets in the "Water Massage Pool"
Outdoor thermal spa pool, the so-called "Water Massage Pool"
The temperature of the mineral water in this pool is 35-37°C. 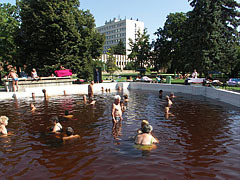 The unique, originally 72°C hot reddish-brown alkaline hydrocarbonate-chloride thermal mineral water comes up from a depth of 2005 meters. 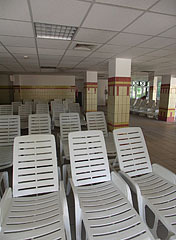 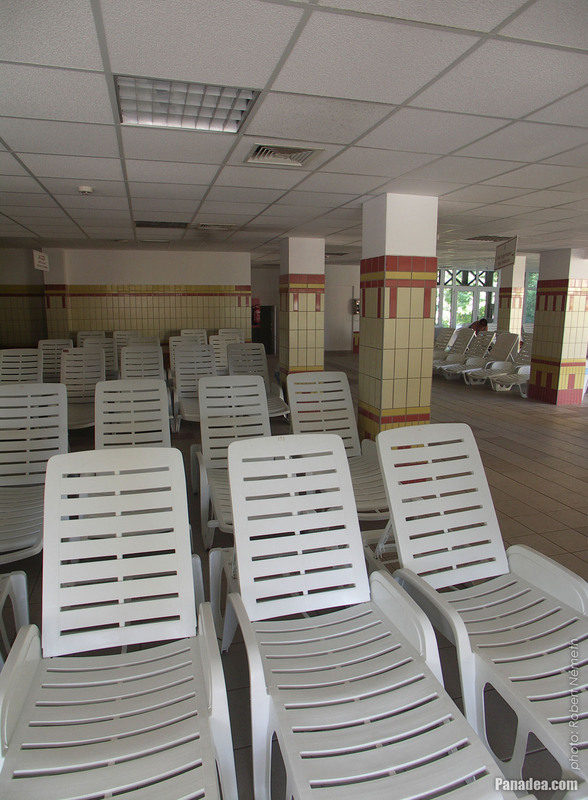 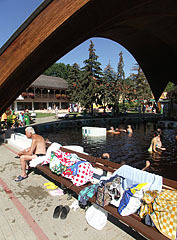 Benches with towels near the "Shaded Pool"
Considering the healing its water was recommended primarily for muscle pain and joint problems. 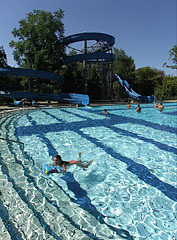 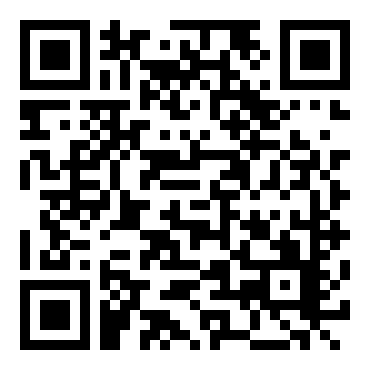 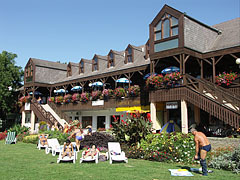 Today the AquaPalota indoor waterpark building can be found on the site of it. 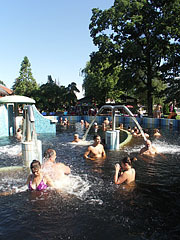 The waterpark was opened in December 2013. 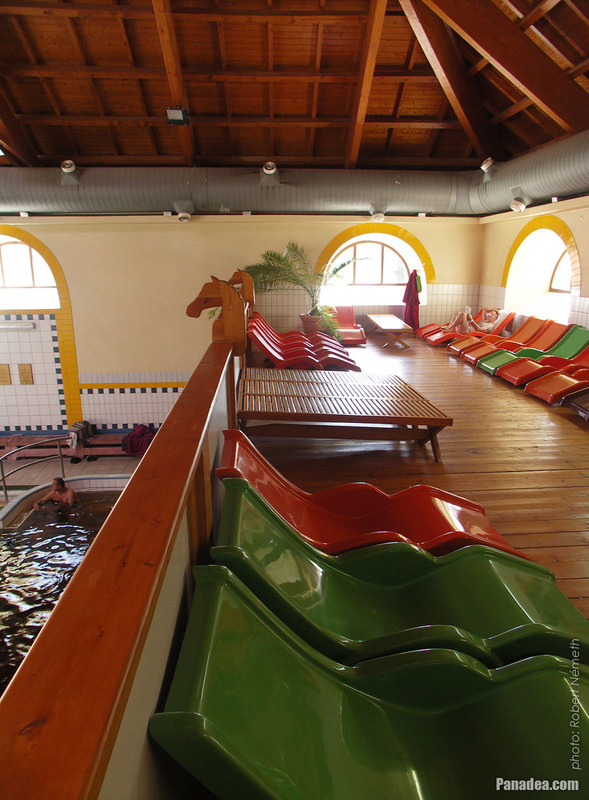 These no longer exist, there is an indoor waterpark in their place since 2013. 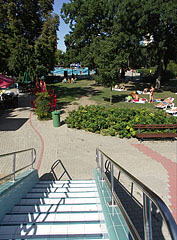 Stairs in the open-air thermal bath at the "Wave Pool"
The "Water Slide Pool" or "Waterslide Pool"
The water temperature is 24-26°C and the negative edge pool is gradually deepens, so it is recommended for the whole family. 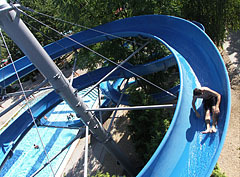 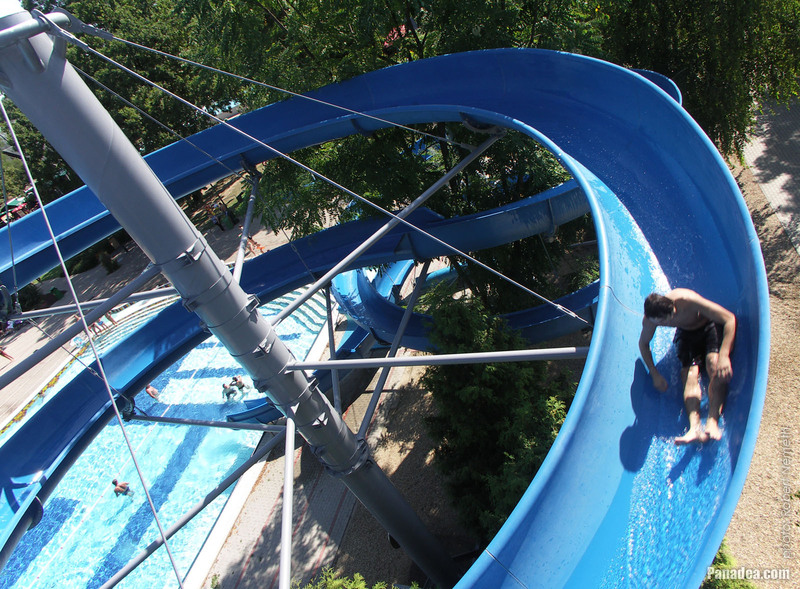 As its name suggests it has water slides, not less than three ones.